I love quickbreads. Always have. Banana bread. Banana nut bread. Chocolate banana bread. 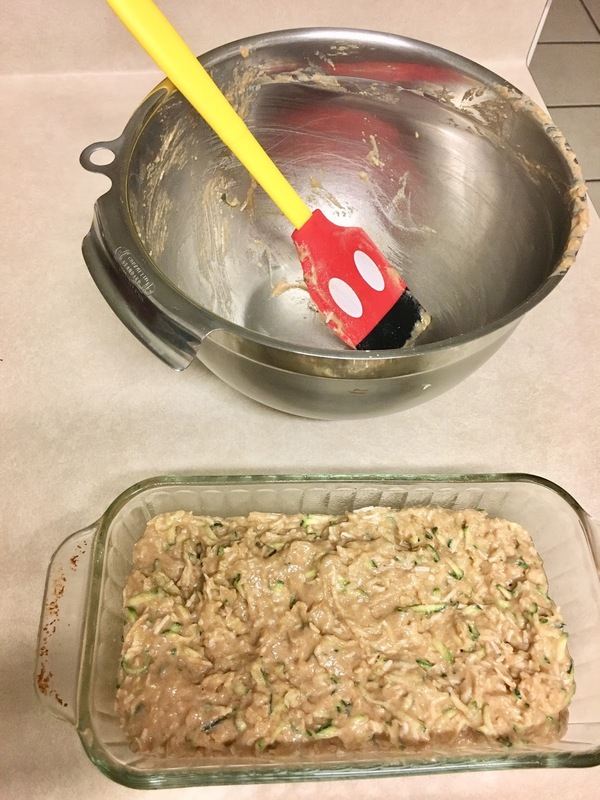 Zucchini banana bread. Zucchini banana nut bread. You get the idea. Then I discovered Zucchini Coconut bread. Imagine those words scripted in the sky with angelic voices singing "ahhhhhhhh" in the background while James Earl Jones says the words aloud, causing all the worlds sick to be healed. It is really that good. After I discovered it a good 5+ years ago, I've played around with a few different recipes. Since it has coconut in it, I have settled on a version that uses melted coconut oil in lieu of any other type of oil or butter. That plus the Greek yogurt keep it nice and moist. If you are one of those people who always has to butter everything, then you can still put a dab of butter on your slice before you eat it. No one will judge you. Since this uses melted coconut oil, which is solid at room temp, NONE of your ingredients can be cold. I have skipped this "bringing to room temp" step many times and the texture is more dry because a lot of the oil hardens and sticks to your bowl or whisk. So don't skip this step. Yes it requires a little more forethought on your part when making it, but so did remembering to buy the ingredients at the store, right? So don't skip this. 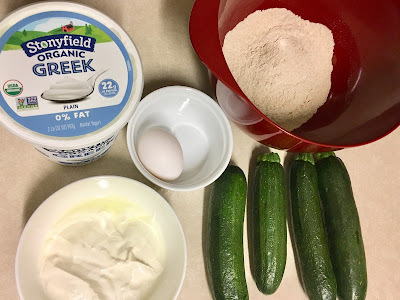 The ingredients that are used that I normally keep cold are the Greek yogurt, egg, zucchini, and whole wheat flour. I keep my whole wheat flour in the freezer because it lasts generally forever that way. Whole wheat anything goes bad a whole heck of a lot faster than the white varieties when left out at room temp. So keep it in the fridge for freezer. Wondering "I wonder if this is still good" is something I like to minimize, so even if I'm going through a lot of whole wheat flour, the freezer is its permanent home. Quick sidebar - We eat A LOT of Greek yogurt. I mean a. lot. Breakfast most days for one or both of us involves Greek yogurt. Thanks to Publix for FINALLY having a organic option for 0% fat plain Greek. I am seriously not going out of my way to get it (ie Whole Foods or Fresh Market). So thank you Prattville Publix! While you are waiting on everything to get to room temp, get out the rest of your ingredients. If you don't have enough of something, you have plenty of time to get to the store and back. 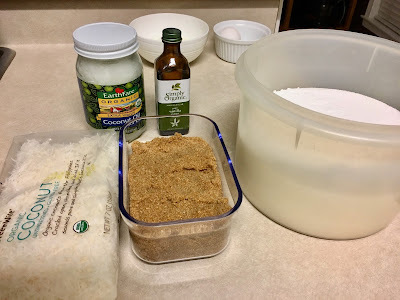 Separate the "dry" ingredients (flours, baking powder, baking soda, salt, cinnamon, nutmeg) from the "wet" ingredients (sugars, coconut, vanilla, egg, yogurt, and zucchini). 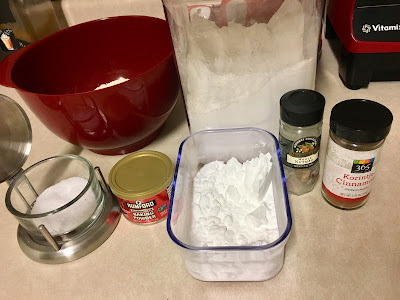 You will end up using the "Muffin Method" (I don't know who coined that, but Alton Brown uses it - he taught me a TON about cooking right as I was really learning in the early-mid 2000s). The Muffin Method mixes the dry ingredients independently from the wet, then you stir them together but not too vigorously and not for too long. You are allowed to have lumps. You don't want to overmix or you'll mess with the texture of the final product, and disturb the baking powder action that happens that moment the stuff gets wet. I could really go all geek on you here, but just google the Muffin Method if you are more curious. Once I started using it for baked goods, pancakes, waffles = WOW. Textures were better! And the pancakes really fluffed up more. I was apparently a big over-mixer before I learned that it is so wrong to over-mix certain things like pancakes batter. Coconut - you can certainly use regular sweetened coconut for this. This is what we all grew up with in the clear bags. I have not found one that is all natural though, but I HAVE found unsweetened organic coconut. So that is what I use. You can certainly use the sweetened kind if that is your thing. 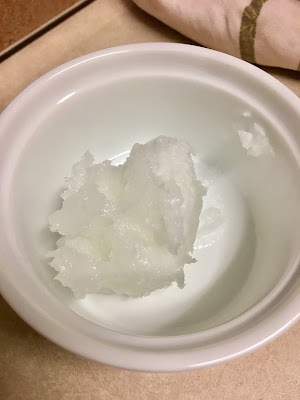 It doesn't take long to melt the coconut oil, and you don't want it getting too hot since you will mix it with an egg. Curdling your egg is bad news. 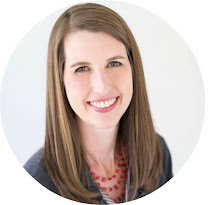 I've done it and you will want to throw a spoon across the room because you just ruined everything and have to start over. So, start melting in the microwave on 5 seconds, swirl it, 5 seconds more, swirl, etc until it's all liquid and no lumps. By swirling you are lowering the temp of the stuff while melting the rest so at the end it's not too hot. This is a good tip for melting butter to use in baking as well. It's also no fun to get it too hot, then have to wait for it to cool down some but no too much it solidifies again. Flour - I don't weigh flour, generally. You certainly could. I scoop with a small spoon into the measuring cup, then level with a knife, thinking of aerating it as I scoop. 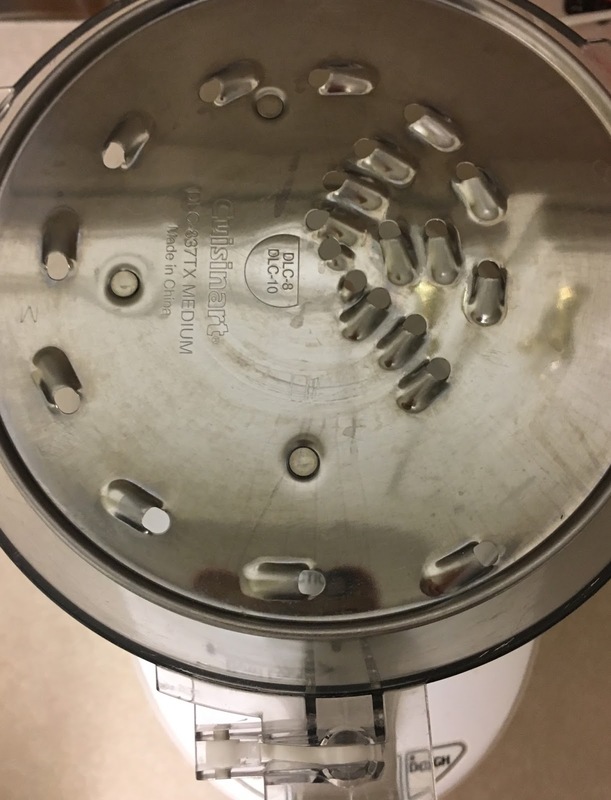 Don't use your measuring cup to scoop the flour from the container or it will be too compact. You will end up with too much flour. That is why you see many people weighing it, or recipes calling for weights vs volume, because 1 cup of flour isn't equal to another 1 cup, depends on how you scooped and measured, the humidity, elevation, etc. I also am a fan of sifting, so I sift all my flour after measuring. I sift as I put it in the mixing bowl. Shredding the zucchini - I love this part. I love it because I love using my food processor. This is fun stuff for me. It makes so many things SOOO easy. I have the shredder blade, which makes short work of anything you want to shred. 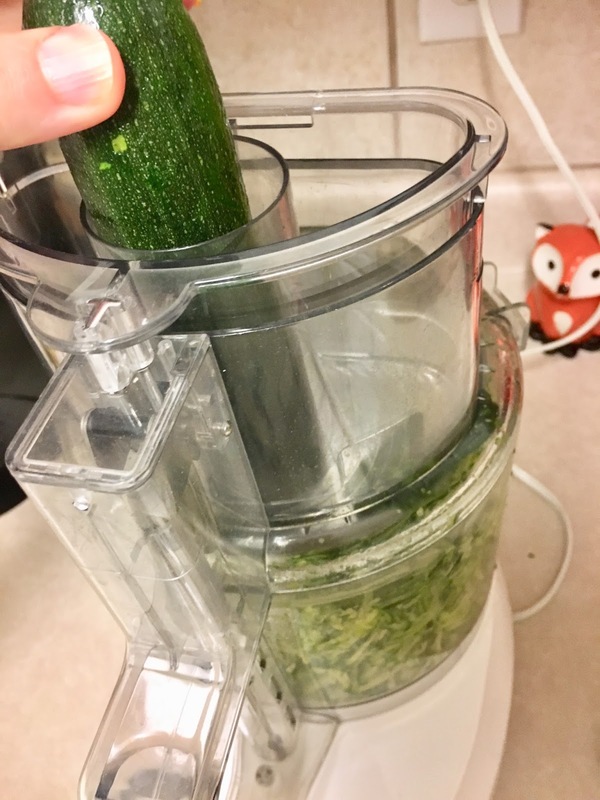 I used my food processor to shred more than any other task to be honest. Cheese and zucchini are the two made things to get shredded in this house. You can throw the blade, and all the plastic parts right into the dishwasher too if you don't want to hand wash them. Just stick all the plastic stuff on the top. Shredded Cheese sidebar - Did you know the pre-shredded cheese in bags is coated with a substance, an anti-caking agent, to keep it from clumping in the bag? It's generally cellulose, which is wood pulp. It's "food safe", supposedly. It's in other foods too where you see "added fiber". Fiber literally does grow on trees, wood is fiber, so where do you think added fiber comes from? Often trees. And no, using wood in food may technically mean it's still all natural (I'm trying to be all-natural with my food) since wood is natural after all, but I just don't particularly like the idea of eating wood with my cheese. I just want cheese. And oh I love cheese so I do eat a lot of it. It can have as much as 4% wood in the shredded cheese and still be legal to be called cheese vs "cheese product with added wood". If I want to eat wood I'll go chew on a stick thank you very much. It's also SO easy to shred your own with an electric appliance, just do that and save yourself from eating a tree with your cheese. 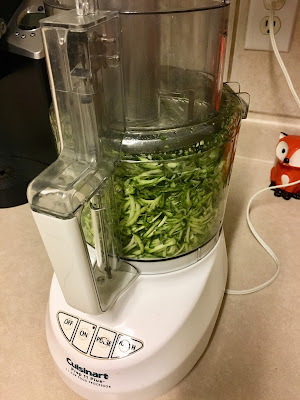 Food processors and stand mixers both have shredding attachments (like the blade below for a Cuisinart food processor), or you can get a hand crank kind like they use at Italian restaurants, or use a good old box grater and you can get some arm exercising in while you cook. Win win. Also, once you use freshly grated cheese you will not want to go back. You will notice it's not all powdery (which is a bit of a turn off anyway you have to admit) and melts a whole lot easier than the pre-shredded kind. Cheddar cheese should melt very easily folks. If it just sits there, well, that is not normal. Thank the wood pulp. Tip on shredding zucchini - use zucchinis on the smallish side. They fit right in the food processor food feeder tube without having to cut them up that way. All I do is wash them and cut off the stem end. Wa-lah. Zucchini has a lot of moisture that you need to squeeze out. This part is fun too. You can use paper towels (make sure they are sturdy) or a cheese cloth (that you can then wash and reuse). I got lazy yesterday and just used paper towels. Squeeze and let the juices drain. No need to go crazy here and squeeze it to death. FYI the four zucchini's I shredded are over twice as much needed for this recipe. I will use for other things like Zucchini Fritters - cue James Earl Jones and angelic music again! I love zucchini fritters. Now it's time to get to mixing. Mix all your wet ingredients sans zucchini, then add in zucchini. Mix all your dry ingredients together too. I use whisks for both (I have two so that makes it easy). Then, combine them together, adding in the wet to the dry. Don't use a whisk for this next step, use a rubber spatula or something else rigid. Use a folding and stirring action while rotating the bowl to make it even. Don't forget to scrape the bottom. Definitely DON'T use an electric mixer. You will certainly overmix. A good rule is to count to 10 and you should be about done stirring by then. After that, fold in the coconut. Scrape into your prepared loaf pan (buttered or sprayed, or use parchment paper). This is great opportunity to show off my new Micky Mouse scraper. See isn't it awesome! On the flip side is a measurement cheat sheet with conversions, etc. I love it. Got it at Disney World earlier this year. Now it's time to bake! When it's done, just like a cake, test it with a toothpick until it comes out clean. For me and my oven, it takes exactly 1 hour. Let is COMPLETELY cool before you cut it or else the moisture will escape, and well, you will have ruined it. Ok not ruined, but you should really wait before you cut it until it's cooled. I have certainly not done this as it is pretty darn good right out of the oven. But just know the consequences of not letting it cool before you slice. Moisture will escape. Perhaps you are eating/serving the entire thing right away so it's no big deal. For me, I let it cool on a rack for a couple hours, then put in the refrigerator overnight still in the loaf pan (mine has a lid). This morning it was time to slice, warm for 20 seconds in the microwave, and eat! For you butter freaks, now is the time you can put a little butter on your slice and enjoy. I don't think it needs it. Preheat the oven to 350 degrees F. Grease a 9×5 inch loaf pan and set aside. Pour the batter into prepared pan. Bake for 50-60 minutes, or until a toothpick inserted into the center comes out clean. Let zucchini bread cool before slicing. Inspired by the recipe from Two Peas and Their Pod - a great food blog!